Delrose I. Froemming, age 86, passed away peacefully on Thursday, January 24th, 2019, at Bethany on the Lake Rehabilitation Center in Alexandria, Minnesota. A funeral service will be held at 11 a.m. Monday, January 28, 2019, at Ebenezer Lutheran Church in Leaf Valley with Rev. Dennis Angland officiating. Music is provided by organist, Kristi Wussow. Burial is at the church cemetery. Visitation will be held from 3-6 p.m., Sunday, at Lind Family Funeral Home in Parkers Prairie and will continue one hour prior to the service at the church. Delrose Ida Ost was born on January 9, 1933, to Emil and Ida (Freudenberg) Ost at home on the family farm in Leaf Valley Township. She was baptized on February 26, 1933, and confirmed, August 11, 1946, at St. James Lutheran Church, South Effington. She attended District #53 Leaf Valley through the 8th grade and following her education she farmed with her family. Delrose married Kenneth Froemming on November 18, 1951, at her home church. The couple farmed together in the Leaf Valley area where they raised their five children. 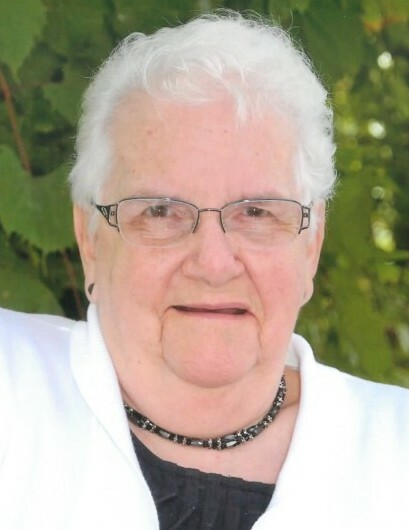 She began working at the Fingerhut Companies in 1967, as a mail packager, and continued working there for 31 years until her retirement on September 3, 1998. After 23 years of marriage, her husband Kenneth died in October of 1975. Delrose and her friend Darlene Witt, traveled together to Alaska, Europe, and many other places. She enjoyed fishing, snowmobiling, teaching Sunday school, singing in the church choir, and dancing to polka and waltz. Delrose was a faithful member of the Ebenezer adult choir and music librarian for the contemporary choir. Above all, she loved spending time with her family and friends. Delrose is preceded in the death by her parents; husband, Kenneth Froemming in 1975; son, Jeff Froemming; brothers, Marvin and Donovan Ost; and sister, Valeda Huwe. She is survived by her children, Kevin (Holly) Froemming of Fergus Falls, Rodney (Mary) Froemming of Garfield, David (Rita) Froemming of Garfield, and Elaine Froemming of Windsor, Colorado; daughter-in-law, Linda Froemming of Garfield; nine grandchildren, Ken (Jen) Froemming, Aaron (Tammy) Froemming, Christel (John) Svingen, Dana (Tara) Froemming, Janelle (Royce) Roers, Patty (Corey) Kolke, Courtney (Amy Willis) Guck, Kelcey (Chris) Bowers, and Russell (Jessica) Froemming; 15 great-grandchildren; and numerous nieces and nephews and other relatives. Pallbearers are her grandchildren. Honorary pallbearers are her great-grandchildren.